Koh Tao doesn’t have an airport, so the only way of getting to the island is by boat. 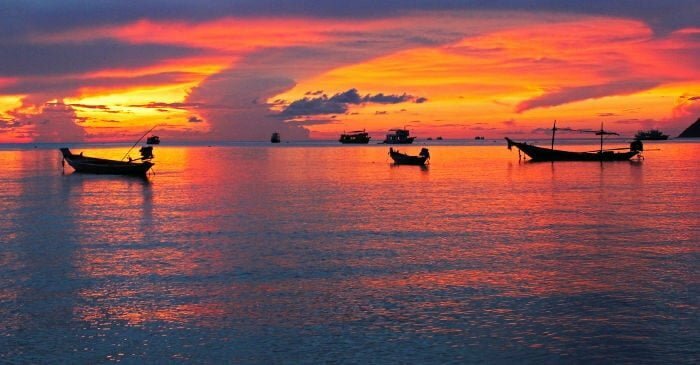 35 kilometers from Koh Tao is the island of Koh Phangan, famous for its full moon party, a beach party held once a month, when there’s a full moon. From Koh Phangan you can reach the dock of Mae Haad in an hour by catamaran with the company Lomprayah, or Seatran Discovery. Alternately, you can use a ferry with the company Songserms, which takes about an hour and a half to get to Koh Tao. The island of Koh Samui is just a little more than 50 kilometers from Koh Tao. There are 8 sea connections each day. Travel times vary between an hour and a half to up to three hours depending on the port you leave from (Maenam Pier or Nathon Pier), and the type of boat. Another options is to go to Surat Thani, and from there take a ferry to Koh Tao. You can get to Surat Thani by air in an hour and fifteen minutes on a flight from Bangkok, with airlines like Air Asia, Nok Air, Thai Lion, or Thai Smile. Local trains also cover this route. The Surat Thani train station is located 14 kilometers west of the city, more precisely at Phun Phin. From Bangkok there are 10 trains daily which reach the Phun Phin station in 9 to 12 hours. There are 6 direct buses a day to Surat from the capital, and they all leave from the south station of Bangkok. There’s just one morning run, at 8:45, all others are handled by night buses. Tickets vary from 502 THB to a maximum of 779 THB. From northern Thailand you can reach the province of Surat Thani by taking a train, bus, or flight with a stop in Bangkok. It’s also possible to get to Turtle Island from the Chumphon region. Whether you choose the train or bus, you’ll have to take one heading to Surat Thani, and stop at the Chumphon stop, located 180 kilometers to the north. The train takes between 7 and 9 hours, depending on the number of stops. The bus takes less time: just 6 and a half hours, and tickets start at a price of 373 THB. For more information on how to travel by train in Thailand, click here. For more information on how to travel by bus in Thailand, click here. Train, bus and ferry tickets can be bought on 12go.asia. For water transportation from Koh Samui, or Koh Phangan, you can check the internet site Ferrysamui.com, or go into one of the travel agencies there in Thailand, or right at the port ticket counter. Click here to read our reviews on the best hotels on Koh Tao. The majority of hotels are found on 3 beaches: Sairee Beach (the biggest), Mae Haad (the one closest to the port), and Chalok Baan Kao. These three places are the easiest to reach since they’re interconnected by roads that can be walked on foot or traversed by taxis or motorbikes. The island’s other beaches don’t have paved roads; this makes them accessible only by foot, taxi, or boat. One of the biggest hotels, located a few hundred meters from the port, is the Koh Tao Beach Club. This resort has a private beach and free shuttle service. A room in the high season starts at 3,000 THB. When it comes to hostels and B&B’s, you can find some but prices are rather high compared to other places in Thailand. The Sairee Sairee Guest House for example, offers rooms for 1,400 THB a night during the month of December. Cheaper still is the Sleep In Hostel Koh Tao. A bed in a dormitory with another 33 people costs 330 THB. In Mae Haad bay you can find 4 star resorts where you can rent entire bungalows for little more than 2,500 THB a night. One example is the Blue Diamond. Cheaper options are the Neptune Hostel (990 THB), and Baan Suan Ta Hotel (950 THB). The range of lodging prices in Chalok Baan Kao Bay are slightly lower than the other two beaches. Rooms at the JP Resort cost between 600 and 1,200 THB; a room at the Koh Tao Toscana resort, not directly located on the water but with a private pool, costs 1,400 THB. A paradise-like island like Koh Tao is often mobbed by international tourists during the high season, but also by Thais during holidays like Songkran or the Loy Krathong Festival. Being very small, the hotel’s islands fill their rooms very quickly. So I recommend that you book well in advance and don’t go directly to the hotels to ask if they have rooms available, as you could do on bigger islands like Phuket. If instead you’re looking for more absolute tranquility and don’t mind going by boat, or spending your entire time on the same beach, then you can choose other locales such as Tanote Bay, where you’ll find the hotel Tanote Villa Hill. The island’s small city center is centered around the port of Mae Haad and its beach. The majority of restaurants serve Thai food, but you can also find taverns with international menus. Among the better restaurants where you can eat fresh grilled fish and even secure a table right on the beach, is Whitening, an appealing open-air place entirely painted in white. On Sairee Beach there’s the King Crab Restaurant (where crab is the boss), the Porto Bello Bistro (an Italian restaurant with wood-fired oven), the Sairee Diving Cottage Restaurant (specializing in grilled fish and meat) and, for fans of Japanese cuisine, Oishi Kaiso. Many other beaches also offer restaurants and counters where you can by food for a few Baht. All resorts also have their own internal restaurants. The most expansive beach on the island is Sairee Beach. A kilometer and a half long and located on the western coast, this bay is suitable for families with children and those who like beach activities such as playing volleyball or canoeing. At Sairee Beach you’ll find white sand and rather clear water. When it’s low tide you’ll have to walk for hundreds of meters before being able to totally immerse yourself. So it really isn’t very well suited for snorkeling or diving. It’s recommended instead for watching the sunset in the evening and having a drink in one of the many bars along the beach, where they often also have live music. Mae Haad Beach is the closest beach to the port of the same name. It’s not a particularly popular place for sunbathing or swimming since the water is dirty due to all the boats that use this bay for docking. Right after Mae Haad is Freedom Beach, one of the whitest and most appealing beaches on the whole island. The beach is small but surrounded by exotic palms and crystal-clear water. Besides the Freedom Beach Resort, on the beach you’ll find a bar completely made of wood where you can drink a cocktail or have breakfast while watching the sun rise. Thiang Og Bay, also called Shark Bay, is another place you must see during your stay on Koh Tao. The beach is made up of extremely white sand and can be reached only by going through the Laem Thian resort. In this section of water you can swim with blacktip sharks (usually harmless to humans), and also see the coral reef. Another ideal place for looking at submarine life is Mango Bay. This beach is surrounded by large stones and the Mango Bay Boutique Resort. Getting to Mango Bay can be rather difficult, since the road isn’t paved and is rather slippery for a motorbike. The best way to get there is by boat, or by a local taxi. Tanote Bay is also connected to the rest of the island by pretty rough roads. However the beach is very beautiful and deserves to be seen. It’s located on the east of the island and is surrounded by thick vegetation. The water on this coast is an intense blue and there’s no shortage of snorkeling opportunities. At Laem Thiam bay you can see sea turtles. This beach is one of the most deserted places on the island and is ideal for snorkeling or diving, considering the depth of the water. One of the reasons why tourists decide to stay on Koh Tao is its splendid marine life. Thanks to activities like snorkeling and diving, you can admire colorful fish, sharks swimming just a few meters from you and, if you’re fortunate, even turtles. Among the best places for diving is the coast along Tanote Bay. In this section of water you can dive as deep as 18 meters and can see animals like butterfly fish, angelfish, various species of mantas and even hawksbill sea turtles. If you want to see sharks, go instead to Shark Bay, also called Haad Tien Beach. This area is located on the southern coast of the island and is famous because of its large numbers of blacktip sharks. Off the eastern coast of Koh Nang Yuang Island (a small islet located a few hundred meters from Koh Tao), there’s a section of sea called Japanese Garden, which is particularly suited for those diving for the first time since it’s a protected area where boats can’t enter. The private island of Koh Nang Yuang is a true paradise for nature lovers. You can get there by renting a boat for about 300 THB a person, plus 100 THB for an entrance ticket. At the beach you’re not allowed to bring towels so that tourists don’t take away even a grain of sand, but you can rent a chair and umbrella for about 200 THB a day. Another thing you shouldn’t do is bring food or drink. In fact, before entering they do a thorough check of your bags and if they find any food or bottles (even water! ), they’ll confiscate it all. There is though a restaurant on the island where you can eat both local cuisine and international dishes. There are lots of diving schools that offer diving courses for all levels, from beginners to expert certification. One of the most highly recommended is Scuba Inction School, which offers personalized courses that start at a base price of 1,000 THB, for a daily diving lesson, to a maximum of 29,000 THB for 4-6 week packages to get certified. One of the most beautiful places on Koh Tao for watching the sunrise or sunset is Mango view point. The road to get there is a bit tiring but once on top you an enjoy a breathtaking view of Sairee Beach. It costs 100 THB a person. Besides the classic boat day tours where you can snorkel or dive, Koh Tao’s agencies also offer multi-day tours, such as a three night/two day cruise where you can visit Ang Thong National Park. It costs 9,000 THB a person, and during the breaks you can canoe, snorkel, dive and climb. Ang Thong National Park is a protected area located 3 hours by boat from Koh Tao. It covers an area of over 100 square kilometers and consists of a good 42 islands, all composed of limestone. On the islands you can visit caves, the Mae Ko lagoon and many beaches. Inland you can enjoy more relaxing activities such as a classic Thai massage at the Royal Thai Massage, enjoy a day at the Majestic Spa, or do yoga at the Shambala center. If you’re interested in local recipes, for 15,00 THB a person you can participate in a three course cooking class at the school Thai Cooking with Joy. For those looking for something adventurous, schools like Good Time Thailand or the Koh Tao Climbing Project offer climbing courses for beginners starting at 2,200 THB for half a day. Both give you the chance to stay at the schools’ buildings, as classes can even last a few months. The local sport, muay thai, can be learned in schools like Island Muay Thai or the Monsoon Gym and Fight Club, but can also be admired at one of the weekly matches where tourists and locals gather in the evening. As with the majority of Thai islands (excluding Phuket), on Koh Tao there’s also no real hospital. There are only pharmacies and a first aid center, the Koh Tao Health Promoting Hospital. Before leaving for Thailand, take out a health insurance policy that will cover your travels abroad. Here you’ll find our suggestions on health insurance for your trip to Thailand. Getting around the island is relatively easy, each hotel rents scooters and small motorbikes for visiting various beaches. However the roads are not the best maintained or sage, especially after a few hours of rain when they create enormous puddles. Moreover, if you should break your scooter no one will ever come to get you and repair costs will be at your own expense, so I recommend that you get to the more spartan beaches via a local taxi, or by water via a longtail boat. If you’re a diving enthusiast, know that the island of Koh Tao is the most famous place in the world for its more than 50 scuba diving schools and apparently also for the ease in which they grant certifications, thanks also to the low prices offered by the schools. You should also keep in mind that if you choose a class lasting longer than 30 days, you’ll need a visa. You can find lots of information on this subject in our guide to getting a Thai visa.